The WorldMillions draw is held every thursday & sunday. Choose to renew your bets automatically by checking the Subscription box and how often using the dropdown box. For example, if you choose 4 weeks, your bets will renew every 4 weeks. WorldMillions – a guaranteed weekly £150 million jackpot prizefund! WorldMillions is a twice weekly jackpot betting product. Every Thursday, there’s an enormous £50 million up for grabs, rising to a staggering £100 million jackpot on Sundays. Regardless of whether there’s a winner, these jumbo jackpots stay the same - week in, week out. Mammoth millions guaranteed! 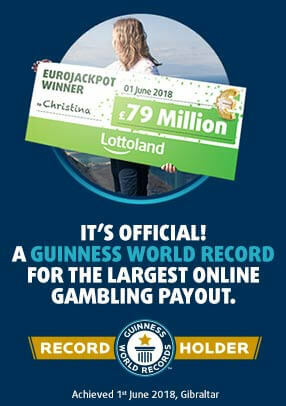 Remember, you can only go for these huge prizes by betting on the outcome of the result with Lottoland. An 8-digit winning number takes it all! With WorldMillions, all you have to do is select an eight-digit number and place your bet. If you match the number in the correct order, you win the jackpot prize amount. You can also win lower-tier prizes by matching various digits from the winning number. The amount you win depends on how many digits you match correctly. For example: if you correctly match the last number, you win the bottom prize tier; match the last two numbers correctly, you win the next prize tier up; and so on, all the way up to the jackpot. There are no duplicate bets on WorldMillions. This means you’ll never have to share a jackpot! For any given number, only 1 person can buy a full bet, 2 people a half bet, 10 people a tenth bet, and so on. You can even set up a subscription, to make sure nobody else takes your lucky numbers. Spread your bets for more chances to win! WorldMillions bets cost £5 for the Thursday £50 million jackpot, and £10 for Sunday’s £100 million jackpot. But you can also stake fractions too.